Many customers are very pleased with MS69 (mint state) or PR69 (proof) graded coins as any imperfections are often invisible to the naked eye. 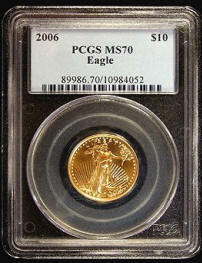 However, if you are looking for the best you can find, then check out the MS-70 coins for sale below. These coins have been graded (mint state 70), certified as genuine, encased in a tamper resistant holder, and assigned their own unique serial numbers. Quantities are very limited! We know you will be pleased. Satisfaction Guaranteed ! This genuine United States government issued gold coin was minted in 2004 and contains a half ounce of gold. Graded and certified as as Mint State 70 (MS-70) by PCGS . Each coin is housed in a sealed in a protective hard plastic PCGS holder. These clear holders are often called slabs. 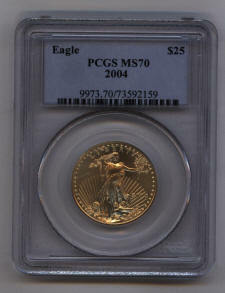 We normally do not have MS70 PCGS slabbed gold eagle coins available. Please order early. A genuine United States government issued gold coin minted in 2006 - contains a fourth ounce of gold. Graded and certified as genuine by PCGS as Mint State 70 (MS-70). Sealed in a protective hard clear plastic PCGS holder (often called a slab). A genuine United States government issued gold coin minted in 2006 - contains a half ounce of gold. Graded and certified as as Mint State 70 (MS-70) by PCGS . Each coin is housed in a sealed in a protective hard plastic PCGS holder. These clear holders are often called slabs. 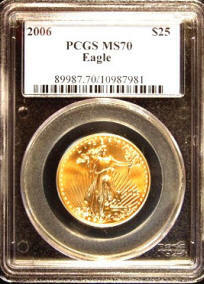 We normally do not have these slabbed MS70 gold eagle coins. Please order early. Click checkout to use PAYPAL to pay with your Visa or Master Card, or confirm your order and mail payment. You may also email us your order. We accept money orders, cashiers check, or personal checks as payment. Thanks!